Why? Stripes are easy to wear and mix. They have that casual vibe, aquatic feel to them, but at the same time, are classy and chic. That’s why this post features the nautical theme with stripes in the leading role. So I am taking it on a cruise around the current nautical trends. Do you want to join? The sail is set so let’s begin the voyage! For my first marine adventure, I invited an Ann Taylor striped fringe top, Calvin Klein white skirt and Kate Spade New York Paloma pumps (similar). Splendid company! The Ann Taylor top is remarkable. If you thought stripes are mundane, be ready to trim your sails! Look at this lavish twist on the stripe pattern. Layers of fringed stripes at the front give this top a rich texture and buoyant character. It floats with body motion and the fringe gleams in the sunset light. The colors of the fringe reflect beautifully the striped pattern of the purse: navy blue, white and rosy dawn. Let’s take a shore leave on this sea journey and inspect one of the fabrics from which the top is made. This fabric is tencel. Have you ever heard about it? It assures the richness of color and that silk like shimmering effect of the fringe. How much attention to the fabric do you pay while buying a garment? For me, it’s almost like checking the itinerary of a cruise. I like to know where I go and what I wear. Tencel is an eco friendly, cellulose fiber made from dissolving wood pulp. It has a high absorbency. It can be dyed to obtain an exceptional color result and easily simulates different textures like suede or silk. That’s where the shine comes from! To complement the top, I paired it with a Calvin Klein quintessential white skirt: a perfect travelling companion for this fancy piece. Kate Spade navy embossed leather heels (similar) add an extra dash of sophistication to the outfit. Metallic point toe with a silver bow and golden stud together with beautifully crafted navy leather make these pumps a stunner. The goldtone stud is a miniature version of the stud that is attached to the navy stripe on the face of the purse. Nothing highlights the rosy dawn shade of the stripes better than rose gold jewelry. I am wearing an Alfani necklace, earrings and bracelet set. It’s wonderful proof that you can mix silver, gold and rose gold pieces together. Look at this glamorous effect! The jewelry design is striking too, with its elongated pieces that resemble the fringed part of the top. So similar in shape and color yet, so different in texture. Now, I almost feel like the lady who had a face that launched a thousand ships. You know who that lady was? Helen of Troy, of course! When she was abducted, a thousand ships set sail to fight her back. That’s how the Trojan Wars started. But let’s return our voyage to peaceful waters. On my left hand: a Kate Spade navy/white stripe ring placed in a shiny gold-plated setting. 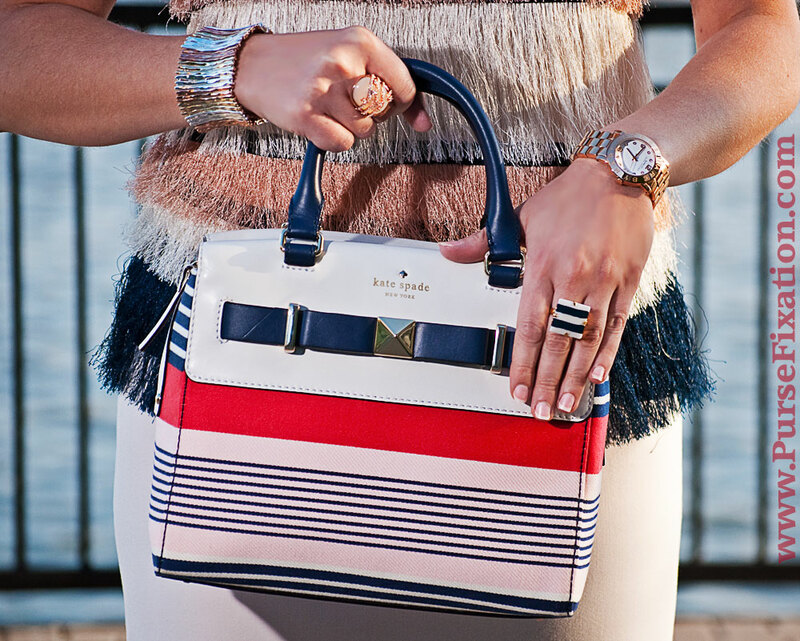 It’s a fabulous addition to the nautical mood. The other ring, from TJMaxx, is truly extraordinary with its glistering wreath of multiple stones formed on a mother of pearl face. The gold tone watch is Marc by Marc Jacobs. 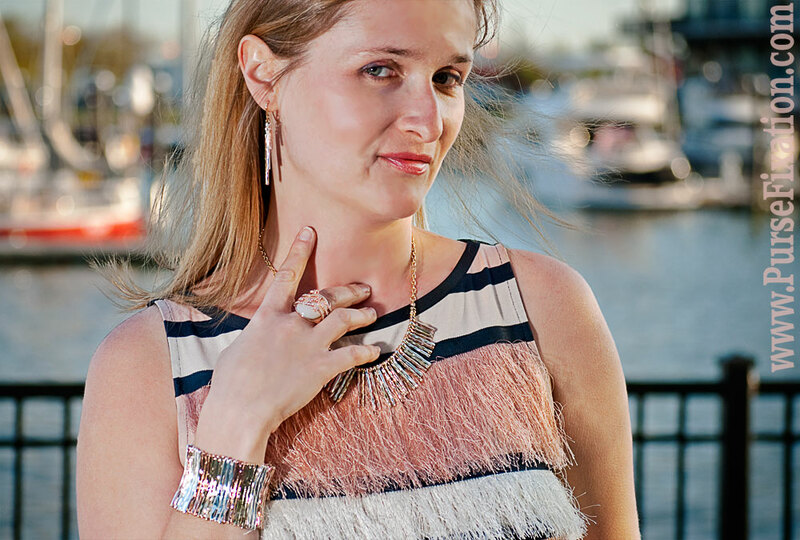 The rose gold tone jewelry looks amazing in the glowing, warm light of the sun setting over the ocean. As the sun is set, let us anchor here and we will continue our sea journey very soon in Part II of Aye, Captain! In the meantime, I would love to hear your nautical fashion stories, aquatic ideas and marine styling adventures. Oh my god that purse! I die! It is divine! Sure lets hit the event together it sounds great! Email me and we can exchange info. My email is on my blog. I love the nautical stripe trend you are rocking! Always reminds me of Summer!